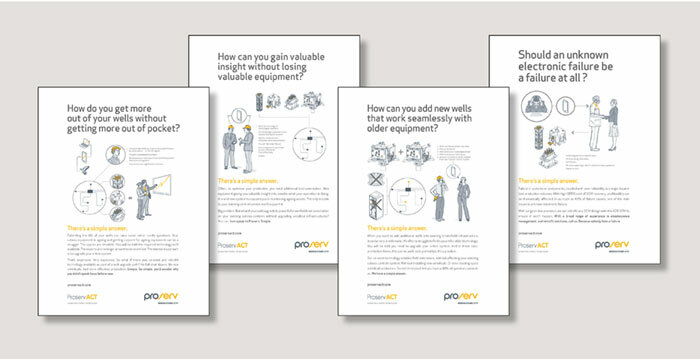 In an industry where over-engineering and complex technologies are common, Proserv’s proposition is based on the ethos of ‘using tried and tested technologies in a clever way’. It sought to make the complex simple and with the advent of a new ‘low oil price environment’ – the offer has never been more relevant. Fifth Ring was asked to develop a campaign idea that would re-energise this proposition and was capable of providing a compelling message at brand level, service level and product level. It would also need to be used across all media. The first focus for the campaign was to promote Proserv’s subsea production services. Historically, repairs and upgrades for ageing subsea production facilities relied on total replacement of equipment due to obsolescence and lack of support from manufacturers. Proserv developed processes and technologies that allow operators to augment their production without the need to replace equipment. This approach has already saved operators millions of pounds in operating costs. We wanted to position Proserv as a ‘challenger brand’ – and to reinforce the idea that this was something new and different, the creative needed to look unlike anything else in the oil and gas market. The visual style was adopted from instruction manuals, where complex items are explained in a simple way. It’s a style we’re all familiar with, be it a piece of flat-pack furniture or an auto repair manual. To take the idea further we adapted these illustrations to tell a story and create a distinct personality for the brand. The copywriting used simple language and spoke in a personal, human way. Engineers in oil & gas love to use overly complex language, so this was a refreshing change. The campaign launched at Offshore Europe, which attracts around 60,000 visitors, and provided content for a pre-show email campaign, social media, online advertising, PR, white paper, presentations and exhibition stand. It was re-purposed for a trade show in Louisiana and was used in the run-up to OTC Houston. The OTC campaign was run across online and offline channels as well as the exhibition stand itself. In a communications environment where companies show very little visual differentiation this campaign breaks new ground and as intended, challenges the norm. “We recently held a webinar to promote Augmented Control Technologies (ACT) and we had over 50 people signing-up based on their intrigue in our offering. From this event, we have 10 new enquiries. The ACT campaign materials have been used at shows all around the world and our offering is creating significant awareness. Based on our attendance at one of the major oil shows, we have been asked to participate in more speaking opportunities and our sales guys have secured many new visits, globally, as it is such a compelling and intriguing proposition brought to life in a very creative and personal way. On social media, our promotion of ACT has resulted in over 300 new followers.